Don't think this will work out well in the long term as the short selling effect wore off. US took this course of action before and DJIA did not really recover well after than. Hence the weakness is always there regardless of the ban. How long is the short selling ban in Europe? LONDON (Dow Jones)--European equity markets rallied for a second session Friday after several countries introduced short-selling bans. The Stoxx Europe 600 index surged 3% to end at 237.49. It extended gains in afternoon trade after an encouraging report on U.S. retail sales, which also buoyed Wall Street. For the week, which was marked by heightened volatility, the Stoxx 600 fell 0.6%. Bank stocks remained the focus of attention after France, Spain, Italy and Belgium all introduced various short-selling bans to try to stem the sector's recent decline. Shares of BNP Paribas rose 4.2% and Natixis added 9.2%, helping lift the French CAC 40 index 4% higher to 3,213.88. The gain came even as data showed the French economy recorded no growth in the second quarter. In other markets that imposed bans, UniCredit SpA gained 5.6% in Milan, Banco Santander rallied 6.6% in Madrid, and Dexia SA surged 17% in Brussels. The gains also came after the European Central Bank said overnight lending to banks through its marginal lending facility fell back sharply, to EUR227 million from a three-month high of over EUR4 billion the previous day. "While the ban on short selling equities may support share prices for a day or two, unfortunately it is highly unlikely to prevent a further selloff," said Manoj Ladwa, senior trader at ETX Capital. "While they may not be able to short sell, any rally in stocks will only give traders the opportunity to close out of existing positions," he added. David Jones, chief market strategist at IG Index, said previous efforts to clamp down on short selling "have done little to calm market nerves." He noted that a similar ban imposed in the U.K. in 2008 provided a temporary boost for markets but that London's benchmark ended up losing another 20% over the next month. Banks in other jurisdictions were also sharply higher, including a 5.3% jump for Barclays PLC in London, which boosted the FTSE 100 index by 3% to 5,320.03. Barclays shares lost a third of their value from the start of July up to Thursday's close. 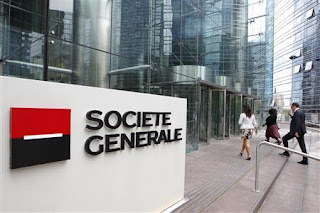 Societe Generale analyst James Invine said in a note to clients Friday that the valuations of Barclays, Lloyds Banking Group PLC and Royal Bank of Scotland Group are "far too low" at just half their tangible book value as stocks have tumbled in recent weeks.